You Read Creation: DON’T LIE, EVEN FOR FUN! Except a very few, most among us can list down the traits of a hypocrite. Often we fail to introspect and realize the tinges of hypocrisy in our diurnal life. 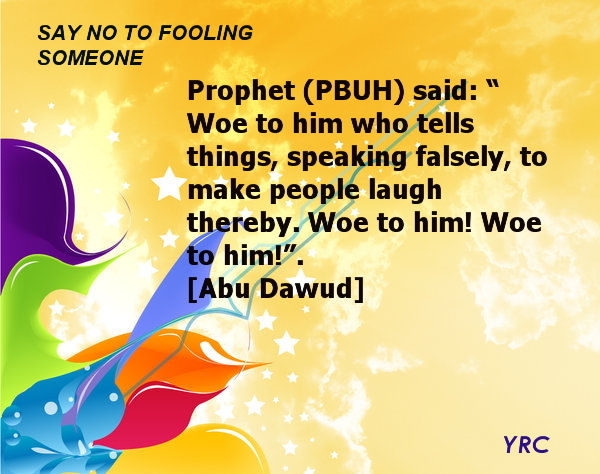 In a hadith Prophet explains the characteristics of a hypocrite. Narrated ‘Abdullah bin ‘Amr: The Prophet said, “Whoever has the following four (characteristics) will be a pure hypocrite and whoever has one of the following four characteristics will have one characteristic of hypocrisy unless and until he gives it up. Whenever he is entrusted, he betrays. Whenever he speaks, he tells a lie. Whenever he makes a covenant, he proves treacherous. Whenever he quarrels, he behaves in a very imprudent, evil and insulting manner.” (Bukhari: Volume 1 Book 2 Hadith 33). There is a story. A mother didn’t reprimand her son who stole his friend’s pencil. She did not bother to enlighten him about the seriousness of committing a theft. Eventually he began stealing many other gadgets of his friends. He grew up into a notorious thief of that land. Similar might be the story of many thieves, shoplifters and pickpockets. Those who are habituated to stealing and lying will not leave it wherever they are. Most of them could have been refrained from growing into notorious criminals if they were heedfully admonished and advised on time. Many of us lie to those munchkins. When they don’t drink milk, eat food or sleep, we scare them with ghost or fairy tales. We promise to get things done and then fail to keep our vow. They grow witnessing these and perceive that deceiving and breaking vows are just a part of life, and nothing wrong in doing it. Children of such parents who are heedful, honest and true to their words in life, very rarely fall into such abyss. ‘It is sufficient lying for a man to speak of everything that he hears’. We often trivialize the act of lying. When judging others, denoting individuals, seeking marriage proposals or even in confabs, we tend to lie either small or big. These won’t even show up in our repentance or while seeking Allah’s forgiveness supplicatingly. This is because we fail to heed its seriousness. in a Hadith narrated by Asma (RA). Some lady said, “O Allah’s Messenger! How thoughtful is Prophet (PBUH)’s elucidation. Islam deems perjuring among the major sins. Nowadays, see many believers immersed in prevarications. It is truly a heart wrenching sight for a true believer. The Prophet (peace and blessings of Allah be upon him) said, “The biggest of the Great Sins are: To join others in worship with Allah, to be undutiful to one’s own parents, and to give a false witness.” He repeated it thrice, or said, “….a false statement,” and kept on repeating that warning till we wished he would stop saying it. pre-prophethood life too. Truthfulness is one of the ‘signs’ of Prophets. Though the Prophets were criticized by non believers upon what they had said and preached, none of them were ever questioned for their personality.. The reason was nothing but the stringent truthfulness and justice they observed in their life. We are the followers of those Prophets and we owe to take forward their mission – da’wah (preaching). Truthfulness is among the best qualities of a da’ee (preacher). If that’s lost, everything else is futile. Anything wrong that happened due to our ignorance or forgetfulness may be forgiven by Our Lord, the Merciful. For that which happened knowingly, we need to repent to Him from the bottom of our heart. We must pledge such that we won’t say or involve in anything which is untruthful. And need to engrave in our minds: “I will never fear anyone in saying, confirming and practicing truth in my life”. Just remember, most people who have told a lie think they got away with it.. when in fact they didn’t.